U. Penn psychologist Philip Tetlock did a lengthy analysis of predictions in politics, and concluded that while most everyone is terrible at predictions, those who have one big idea that they apply to everything do far worse than those who incorporate a diversity of ideas and sources (the former are Isaiah Berlin’s hedgehogs, the latter are foxes). Knowing how dangerous predictions can be has led me to be careful about tossing them around willy-nilly, but I’ve also noticed something else: People like predictions. When I’ve made an emphatic one, it tends to get more links and tweets. Whenever I see friends or relatives whom I haven’t seen in a while, or meet someone who finds out what I do for a living, invariably I get asked what I think the outcome of the moment’s political conflict is going to be. 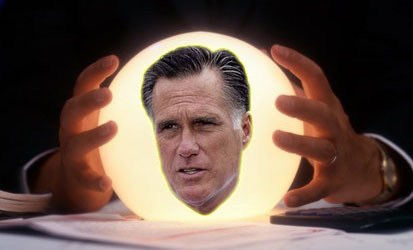 I tend not to make too many predictions myself, though I confess that Romney’s eventual victory seemed so obvious to me that I was always a bit flummoxed that so many people seemed so certain someone else would take him down. It’s one thing to see people making lots of different predictions about, say, whether the eurozone will survive. That’s a genuinely hard problem. But why were so many people willing to get on the bandwagon for Michele Bachmann or Rick Perry or Newt Gingrich? That’s craziness. But I think Paul has the answer: most pundits don’t really care if they’re right. It’s not like they have any money riding on their predictions, after all. But predictions stir the pot, and unusual predictions stir the pot even more. This — controversy, provocation, contrarianism — is the coin of the realm for political pundits. Even among their peers they don’t get any props for being right, since political reporters, in their heart of hearts, probably believe the whole enterprise is completely chaotic and inherently unpredictable in the first place. I have to admit that I’ve always wondered how good my own prognostication skills are. No better than a coin flip, I’d guess, but the only way to find out for sure would be to plow through a year’s worth of past posts and start grading them. There’s no way I’m doing that, and there’s certainly no incentive for anyone else to do it. That’s true of everyone else too, which is why we never have a very good sense of who’s a good forecaster and who isn’t. It’s because, really, we don’t want to know. Hell, if someone did turn out to have a good record, we’d probably chalk it up to luck and then go on ignoring them. An accurate crystal ball just gets in the way of a good conversation, and that’s the ultimate sin.